Let us welcome New Year 2018 with lots of positive attitude. New year is the time when people make or break resolutions. During new year, friends and relatives send new year wishes, new year quotes, new year messages, new year sms to welcome the year with a positive note. 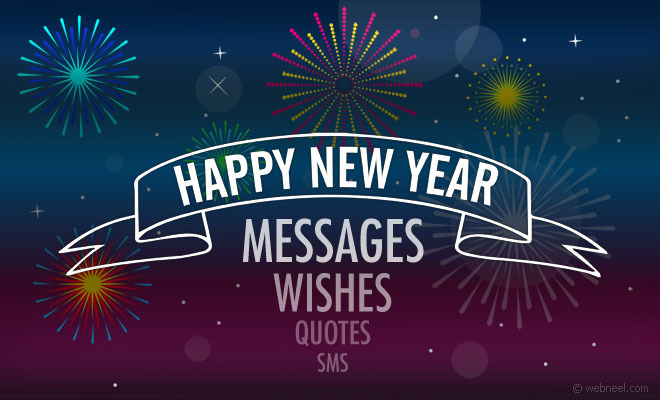 Most adults and kids happen to own a smartphone, so sharing new year wishes and new year quotes have become easy. If you don't have the time to create your own new year sms or new year message, you can just share what we have posted on our page. Earlier days, people to used to buy season's greetings and send it through post, all that gum, stamp and writing address, is all long gone. Nowadays you just need an email id or whatsapp number to share new year greetings. Even though we welcome the new era with open arms, let us still enjoy the small nicks and picks of life, like going home and wishing your parents, 'Happy New Year'. Enjoy these beautiful New Year Quotes and Wishes. Tomorrow is the First Blank Page Of A 365 Page. Write A Good One. Everyday Is A New Opportunity To Have A Fresh Start. A New Year Is On The Way And The Possibilities Are Endless. This Year Believe In Yourself And Achieve Everything You Deserve. Wishing You A New Year, Bursting With Joy, Roaring With Laughter And Full Of Fun. May The New Year Bring Joy, Peace & Happiness To You & Your Entire Family. I wish you Happy New Year from the bottom of my heart. May God give you the happiness and strength to overcome your past year failures. A New Day and a brand New Year have come, bringing with it opportunities to shine. Let this New Year be the one, where all your dreams come true, so with a joyful heart, put a start to this year anew. Wishing you a happy and prosperous New Year 2018. The New Year is the time of unfolding horizons and the realisation of dreams, may you rediscover new strength and garner faith with you, and be able to rejoice in the simple pleasures that life has to offer and put a brave front for all the challenges that may come your way. Wishing you a lovely New Year. Wishing you a year that is filled with all the fragrance of roses, illuminated with all the lights of the world and be blessed with all the smiles on the planet. Even if our talks may lessen, and so might our hellos, our stories might shorten along with our greetings, but remember that no matter what happens, my prayers and wishes for you will never fall short. May this year be the best year by far, and may this year bring with it endless joy and happiness. On this New Year I wish that you have a wonderful January, a lovely February, a Peaceful March, a stress-free April, a fun-filled May, and Joy that lasts from June to November, and finally a happy December. In 2018 I wish that may you not only change the date of the calendar, but also your focus, commitments, and actions for a more fruitful year ahead. In this New Year, I wish you achieve all your goals in life, And get success at every step of life, enjoy a rocking year. I pray that this New Year brings to you happiness and joy forever and ever. Hope this 2018 bring Happiness for you Dear. in your life as flowers in a garden. In the New Year, May your right hand always be stretched out in friendship, never in want!